South Korean President Moon Jae-in and his almost 200 member delegation have completed their first day of summit talks in Pyongyang, North Korea. While it's the third face-to-face meeting between Moon and North Korean leader Kim Jong Un this year, this inter-Korean summit also celebrated a number of firsts, according to South Korean spokesman Yoon Young-chan. Yoon told reporters Tuesday's events marked the first time Kim Jong Un has opened a summit in Pyongyang. The military band, he added, welcomed the South Korean delegation with music usually reserved for the upper echelon of North Koreaâs leadership. 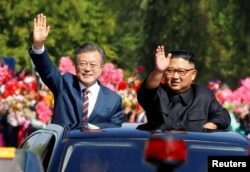 South Korean Presid ent Moon Jae-in and North Korean leader Kim Jong Un wave during a car parade in Pyongyang, North Korea, Sept. 18, 2018. It was also a first when Moon and Kim walked along the red carpet at Pyongyangâs Sunan International Airport and the South Korean leader inspected North Korean troops. Following the welcome ceremony at the airport and separate lunches, the first session of the inter-Korean summit began at 3:45 p.m. local time, in the headquarters of the Central Committee of the North Korean Worker's Party. South Korean President Moon Jae-in and North Korean leader Kim Jong Un arrive at the Paekhwawon S tate Guesthouse in Pyongyang, North Korea, September 18, 2018. Prior to the leadersâ summit, Moonâs wife, Kim Jung-sook departed for Okyu Children's Hospital at 2:30 p.m. accompanied by Kimâs wife, Ri Sol Ju. Yoon Young-chan told reporters the pair would sign a guest book, view an X-ray or CT room, and possibly speak with children during their visit. They then traveled to the Kim Won Gyun University of Music and were accompanied by composer Kim Hyung-suk and K-pop stars Ailee and Zico. Choi Tae Young, president of the College of Music, welcomed the delegation who escorted them around the facility. Other South Korean envoys met with the chairperson of the Supreme People's Assembly, Kim Young-nam, Tuesday afternoon, while business leaders met with Deputy Prime Minister of Ri Yong Nam. Leaders from three of Seoulâs political parties were scheduled to meet the Vice Chairman of the Supreme People's Assembly, An Dong Ch un. Delegates who represent civil society sectors met with Kim Young Dae, chairman of the Social Democratic Party. 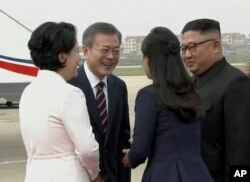 South Korean President Moon Jae-in, second from left, and his wife Kim Jung-sook, left, are welcomed by North Korean leader Kim Jong Un and his wife Ri Sol Ju upon their arrival in Pyongyang, North Korea, Sept. 18, 2018. Following the summit, President Moon and the South Korean delegation will watch a performance of the Samjyun Orchestra at the Pyongyang Grand Theater, located on the Daedong River in Pyongyang. The day is expected to conclude at 9 p.m following a welcome banquet in Mokran Hall, a spec ial facility dedicated to hosting foreign officials. During Tuesdayâs afternoon briefing to reporters, Yoon said it was unclear how much progress would be made on denuclearization issues and that it would be necessary to wait until after Wednesdayâs talks before any conclusions, if any, would be announced. Moon says denuclearizing the Korean Peninsula cannot be achieved without direct talks been Kim and U.S. President Donald Trump. âI have confirmed the true will of Chairman Kim Jong Un and President Trump several times. I believe that the denuclearization issue can be progressed at a rapid pace if the two leaders face each other again and talk,â said Moon. 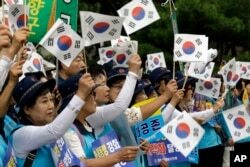 South Koreans wave their national flags during a rally to wish for the successful inter-Korean summit near the presidential Blue House in Seoul, Tuesday, Sept. 18, 2018. Yoon Young-chan said Moon would relay the outcome of his denuclearization discussions with Kim directly to President Trump during the United Nations General Assembly later this month. Handong Global University Professor Kim Joon-hyung called the third inter-Korean summit an extension of the first, during a Monday panel discussion in Seoul. We need to have âa more concrete agreement on inter-Korean relationships and reducing the [military tension],â he said. He said that is contingent on what types of concession Moon can get from his North Korean counterpart and share with Trump. 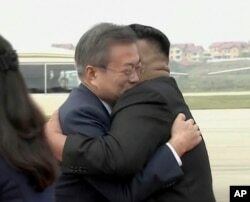 South Korean President Moon Jae-in, left, hugs North Korean leader Kim Jong Un upon arrival in Pyongyang, North Korea, Sept. 18, 2018.